VideoMach is an image conversion utility which can transform your series of digital photographs into a lovely looking video sequence. If you have multiple different types of photos with different resolutions, it's actually quite simple to use VideoMach as it supports several different image formats such and your typical digital photograph JPEG files, along with MPEG videos, PNG files, WMA and more. The photo/video editing functions of VideoMach allow you to balance colours, crop images to remove borders and apply one of the many Photoshop-style image filters to the photos you are creating a movie out of. 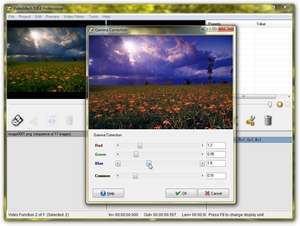 The video conversion utility of this application also sports a file conversion utility with support for all of the major video, image and audio formats. VideoMach 5.15.1 is a shareware program and can be used as a demo to try the software until the free trial period has ended. A full version of the program is available after the trial period ends. For security reasons, you should also check out the VideoMach download at LO4D.com which includes virus and malware tests. Additional screenshots of this application download may be available, too. VideoMach has a presence on social networks.